The following is a homily that I gave during the Inaugural Mass of the Fra Angelico Institute for the Sacred Arts which occurred on Friday October 28, 2011 at St. Francis of Assisi Church (Diocese of Providence) in Wakefield, Rhode Island USA. The Institute can be contacted at frainstitute@cox.net for membership information. 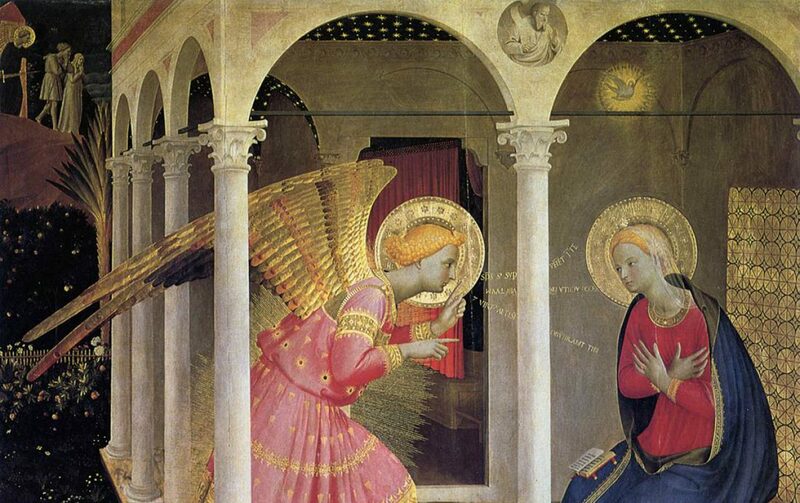 We are on Facebook at Fra Angelico Institute for the Sacred Arts. Tonight’s inaugural Mass of the Fra Angelico Institute for the Sacred Arts falls on the feast day of two Apostles – Saints Simon and Jude Thaddeus. The Gospel for today’s feast, speaks of how Jesus called the disciples together and selected twelve of them to be Apostles. They traveled with Jesus during His ministry, received the gifts of the Holy Spirit at Pentecost, and were sent to preach the Good News of the truth, goodness, and beauty of salvation through Jesus Christ. When my wife Jackie and I founded the Fra Angelico Institute for the Sacred Arts in 2009 we knew it would be a missionary effort; and that as a lay apostolate of the Church, with a cleric – myself – as its director, it exercises a specific ministry through the permission and blessing of His Excellency Bishop Thomas Tobin, our pastor Monsignor Paul Theroux, and our chaplain Father Joseph Upton. The document entitled Apostolic Activity, the Second Vatican Council’s 1965 Decree on the Apostolate of the Laity, defines the mission of all adult Catholics to “lead non-believers to the faith and to instruct, strengthen, and encourage the faithful to a more fervent life; [so that they may understand that] God’s plan for the world is that men [and women] work together to renew and constantly perfect the temporal order.” The Fra Angelico Institute for the Sacred Arts was formed primarily to contribute to accomplishing these goals. Our mission is to deepen the prayer life of all our participants by evangelizing the truth, goodness, and beauty of God through the understanding and creation of sacred art. I emphasize creation of sacred art because, as artists, novice or veteran, we have been given the grace to appreciate, care for and the desire to create sacred art in all it’s various forms. Our Institute has twelve Guilds within it and each Guild is a specific branch of art in which the artists produce sacred art at their own pace, with complete freedom, and with the understanding that their final product should reflect and promote faith in the truth, goodness, and beauty of God as taught by the one Holy, Catholic, and Apostolic Church. Florence during the early and mid 15th century, painting and illuminating masterpieces whose beauty haunts us to this day. His art radiates stunning simplicity and has a profound ability to preach the truth, beauty and goodness of God, His angels and His saints. Yet , as foundation stones of this Apostolate, it is our belief that this mission is not just for artists within the Dominican Order. All Catholic artists – ordained, professed religious, or laypersons have the ability to reach deep within the human mind and soul and restore the fires of faith and love for God. Like Saints Simon and Jude – we have been called to continue the mission of the Apostles in a special way. Catholic artists, in the state of grace and creating art for the sake of evangelization – their own and others – have the power to change the perspective and habits of the most hardened soul, and that is the hope of this Institute: to study, pray, and produce art that inspires others to a greater love for God and His Kingdom. May God bless you for your sincere interest and participation in this Institute; and may saints Simon and Jude Thaddeus, and Blessed Fra Angelico, pray for us. The painting above of the infant Jesus is by Fra Angelico and it is a close-up of the painting entitled Madonna delle ombre (Madonna of the Shadows), painted around 1450. It is a fresco painted in egg tempera. It is located in the Museo di San Marco in Florence. The information on this blog is valuable. Evangelize the truth, goodness, and beauty of God through the understanding and creation of sacred art, is a great mission.